A new bioengineering approach for boosting photosynthesis in rice plants could increase grain yield by up to 27%, according to a study publishing January 10 in the journal Molecular Plant. The approach, called GOC bypass, enriches plant cells with CO2 that would otherwise be lost through a metabolic process called photorespiration. The genetically engineered plants were greener and larger and showed increased photosynthetic efficiency and productivity under field conditions, with particular advantages in bright light. In the new study, the researchers developed a strategy to essentially divert CO2 from photorespiration to photosynthesis. 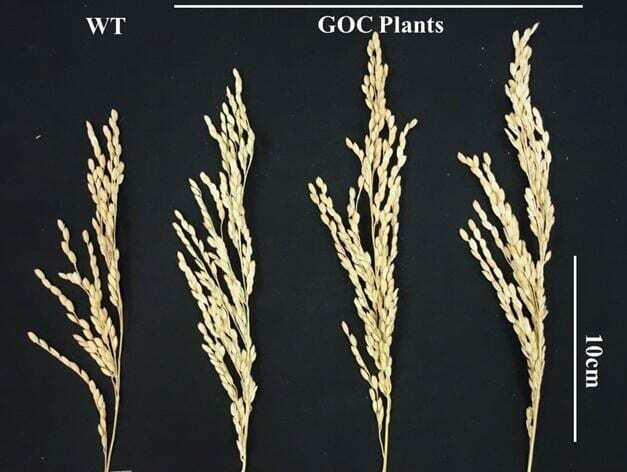 They converted a molecule called glycolate, which is produced via photorespiration, to CO2 using three rice enzymes: glycolate oxidase, oxalate oxidase, and catalase. To deploy GOC bypass, which was named for the three enzymes, the researchers introduced genes encoding the enzymes into rice chloroplasts–organelles where photosynthesis takes place in plant cells. This work was supported by the National Natural Science Foundation of China and Science and Technology Project of Guangzhou City.